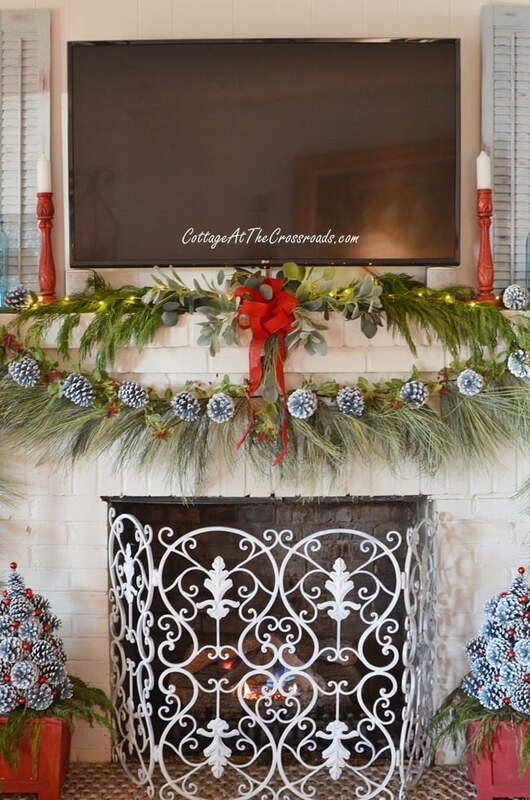 In this post, you’ll find a creative way to decorate a traditional Christmas Mantel with Pine Cone Trees and garland. Fa la la everyone! 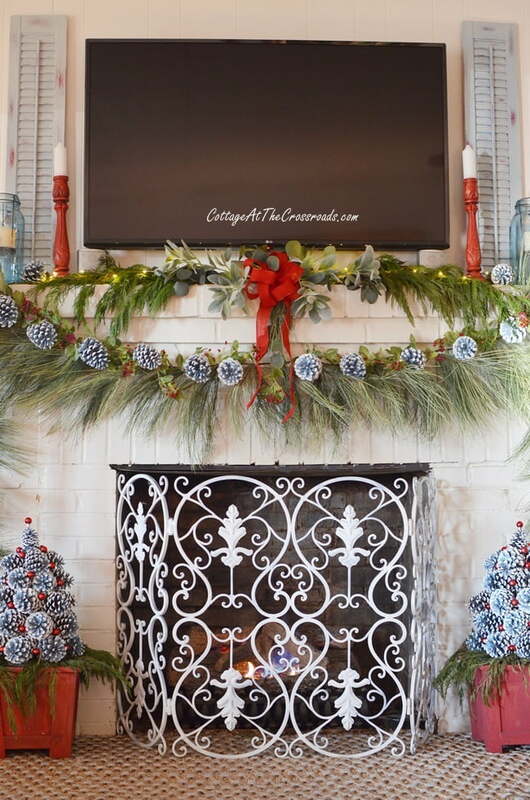 We are all busy as beavers at this time of year decking the halls and preparing for the holidays, but I had to take the time to show you this year’s Christmas mantel with pine cone trees! 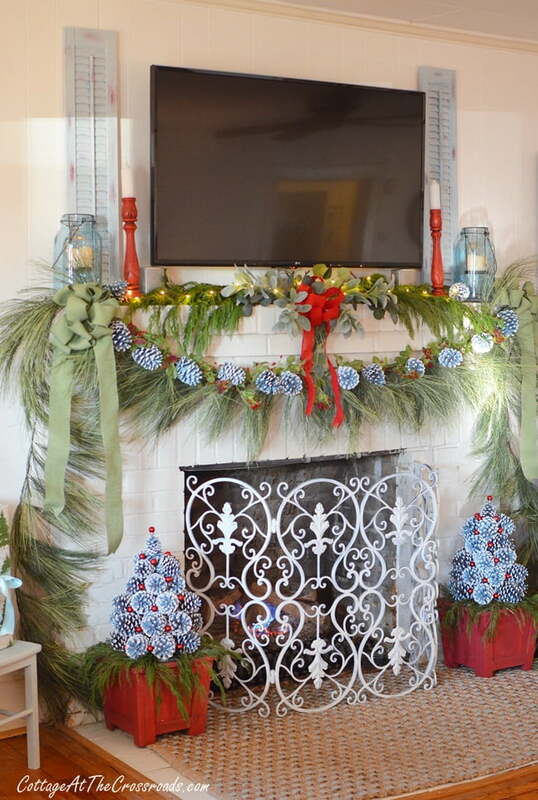 This traditional Christmas mantel is done with the expected colors of red and green but with a twist of blue thrown in! Last year, I started bringing in a little more blue into our living area which already has a lot of green and red elements. So I decided to stay with that color combination when I decorated our mantel for Christmas. 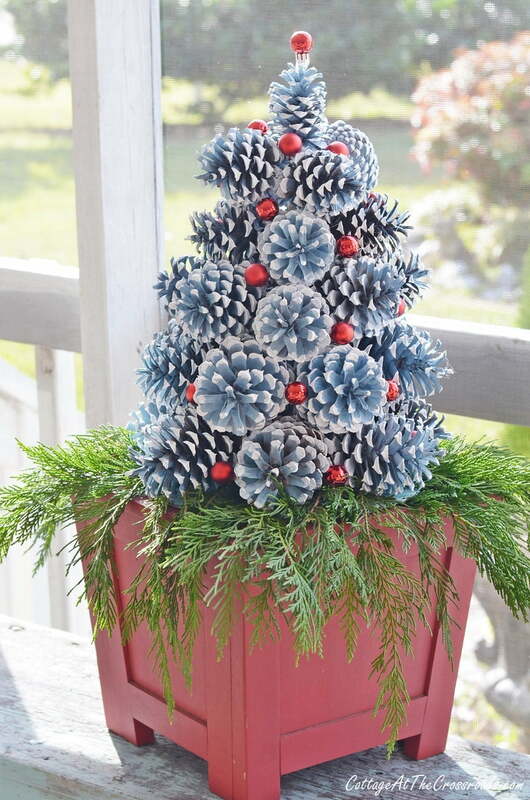 Since I already had these red wooden planters and an abundance of pine cones, I decided to make some blue pine cone Christmas trees last month. Just in case you missed it, my tutorial on how to make them is HERE. We have had the red wooden candle holders for many, many years and had even put them in storage but out they came to pull in the red color. 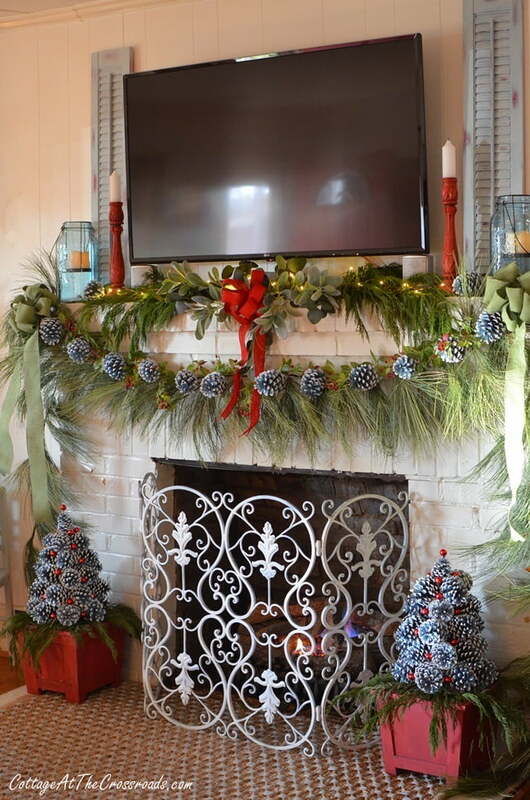 An few blue painted pine cones sit on top of the mantel as well. 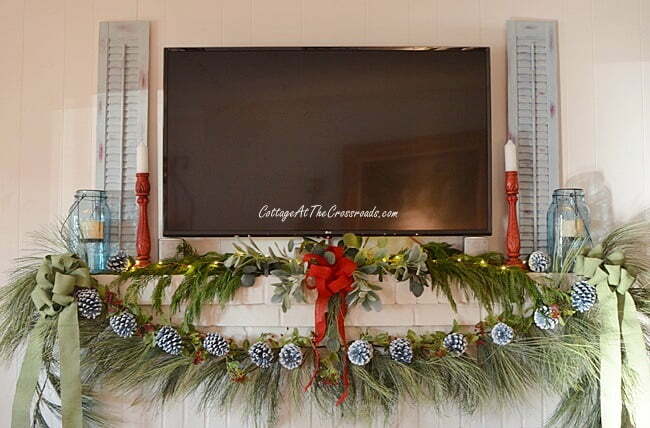 The wispy pine garland has been used in decorating our mantel for the past few years. I purchased it at a local garden center-Taylor Garden and Gift Shop. Although it is faux, I think it is very realistic looking. Since I already had plenty of blue painted pine cones, I decided to attach them with floral wire to the pine garland, giving the look of a pine cone garland without the additional work of making one! 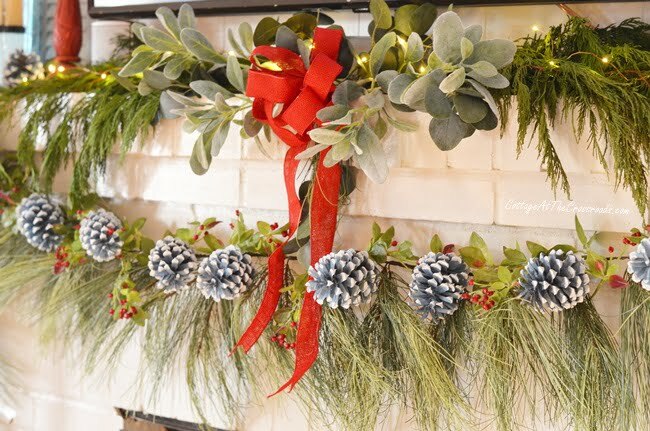 Pieces of faux greenery with red berries are tucked among the pine cones giving a full, lush look. On top of the mantel is some real Leyland cypress from the yard along with some faux lamb’s ear that I found at Hobby Lobby. 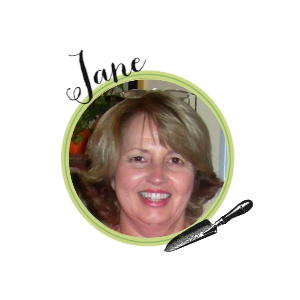 A strand of (Amazon affiliate link) fairy lights is tucked in the greenery. They make anything look magical! 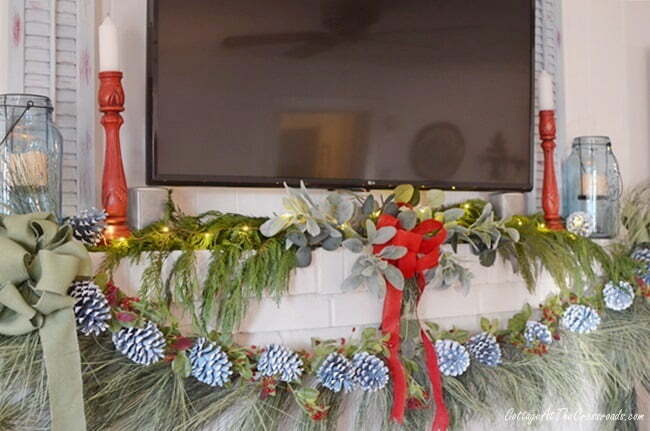 The green bows had been used in decorating the mantel in a previous year. To freshen them up, I took them apart, ironed the burlap ribbon, and enlisted the aide of a friend to remake them. I actually got everything in place and realized that the mantel display was missing something. So after a few days, I made the red bow with some ribbon that I had in my stash. YES! The additional pop of red was the missing element! I did want to mention our new rug on the hearth. It has strands of light blue, and I found it at the At Home store in Charleston. The 3′ x 5′ rug was a bargain at $29! This is where our dog Lucy sleeps most of the time and I was afraid she would not like a new rug but she took to it immediately. Here you can see the corner next to the fireplace. The tabletop Christmas tree is in its usual place. It, too, is decorated in the same colors of red, blue, and green with lots of white Santa ornaments that I’ve collected for years. 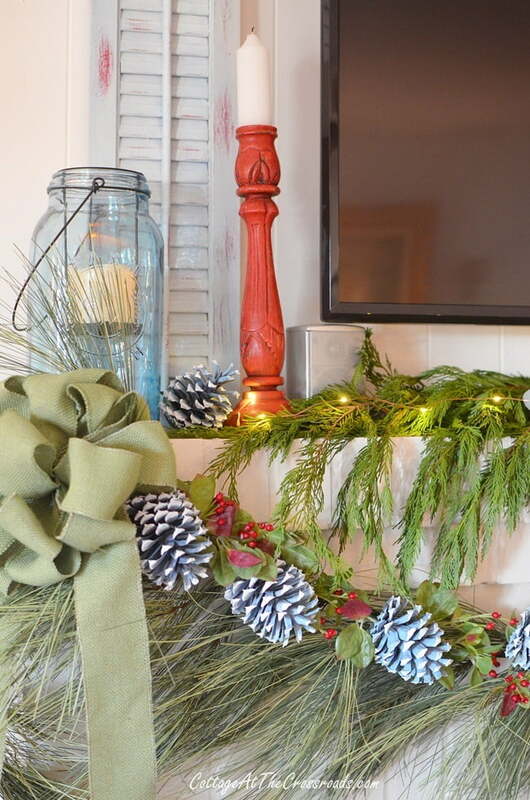 Without a doubt, the stars of the Christmas mantel are the blue painted pine cones! 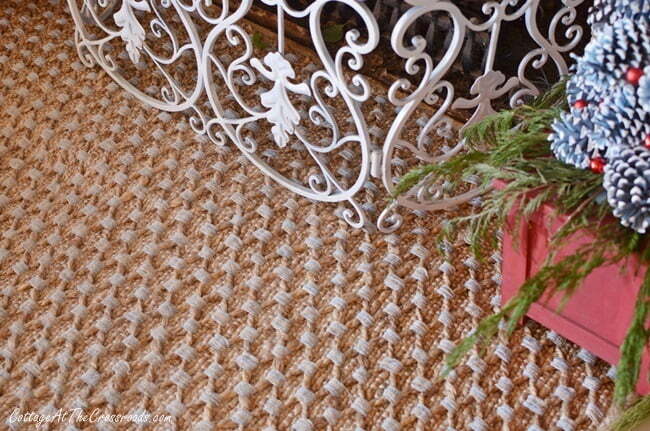 This traditional, natural element used in Christmas decorating has been elevated by simple paint! And I just adore the pine cones trees at the base of the mantel. I think I’ll be leaving the mantel decorations up long after the holidays because of how cozy it makes this room look. 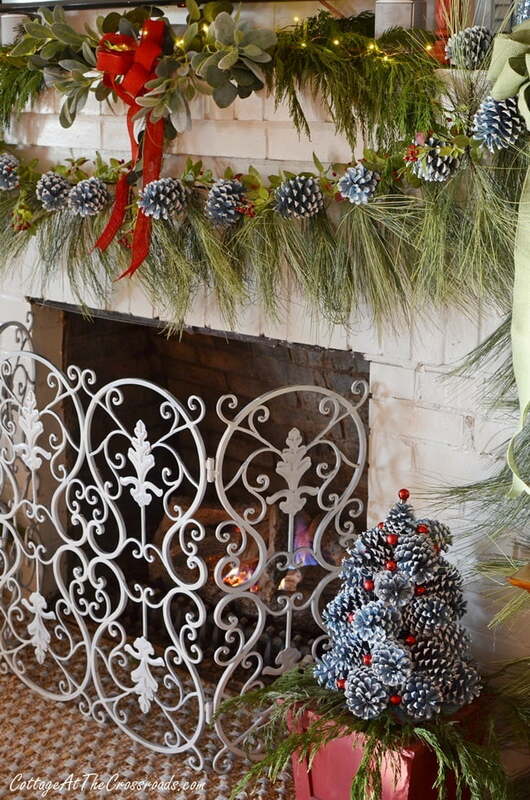 I hope you’ve enjoyed seeing our Christmas mantel with pine cone trees! I’m still working on getting the cottage all decorated for Christmas. Things have been going slowly due to commitments and appointments, but I should be all done by this weekend. How about you? Are you a slow pokey like me? Beautiful! 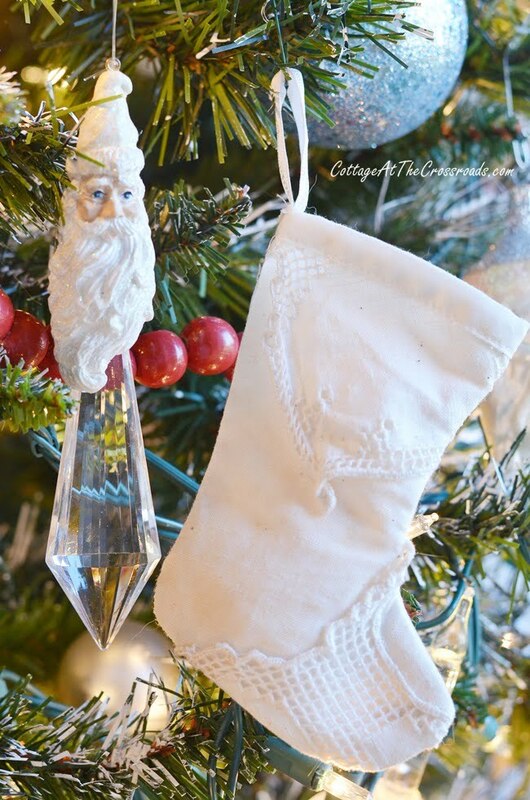 I love your home….especially at Christmas! It’s so homey and cozy! This all very nice and festive as well as warm, I too add things all during the holidays to my displays, I call it tweaking and the more the merrier. You are very inspiring keep posting please. Love the touches of blue. My favorite color but find it hard to use at Christmas. Thanks for some great ideas. The room is so pretty. You always do such a lovely job. I LOVE your Christmas decorations, Jane, your home is so festive and cozy. I have so admired the screen in front of the fireplace; it’s so ornate. May I ask where you came upon this? I’d love to have one; however, I have a feeling that I’m out of luck. MERRY CHRISTMAS TO JANE, LEO AND LUCY. 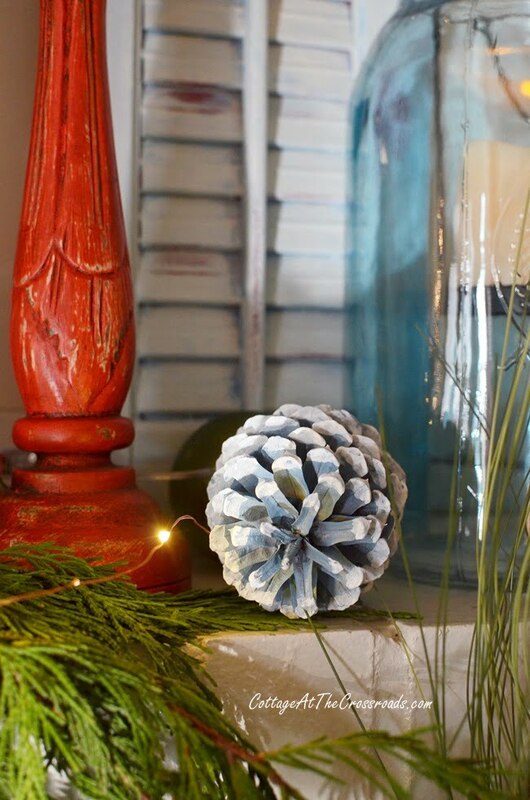 This is so pretty Jane, I am crazy about your pinecone trees! Your mantel is simply beautiful. I could have sworn that was real pine! 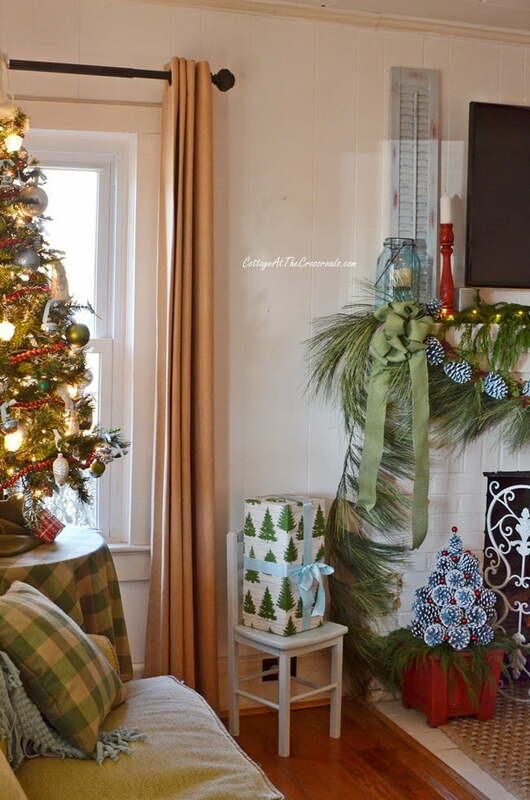 I love the cypress, I do that every year, I love how it drapes over the edge of the mantel. Oh my Jane!!! 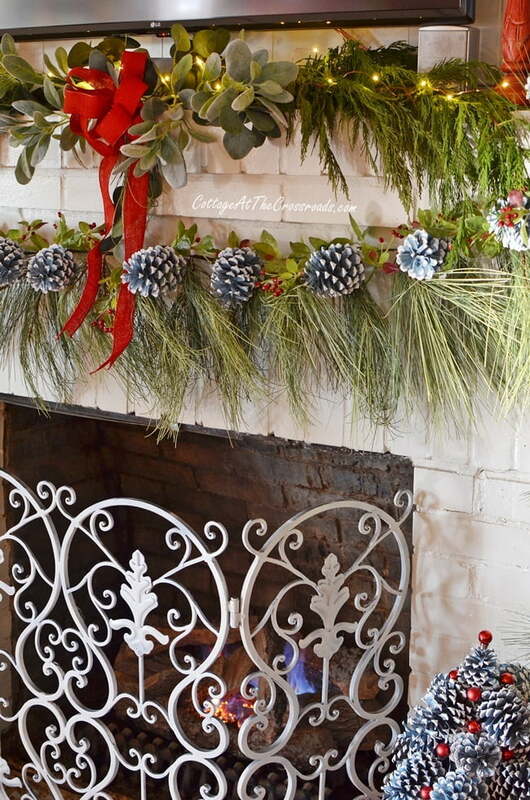 I love your pinecone garland…you are truly the creative one!! 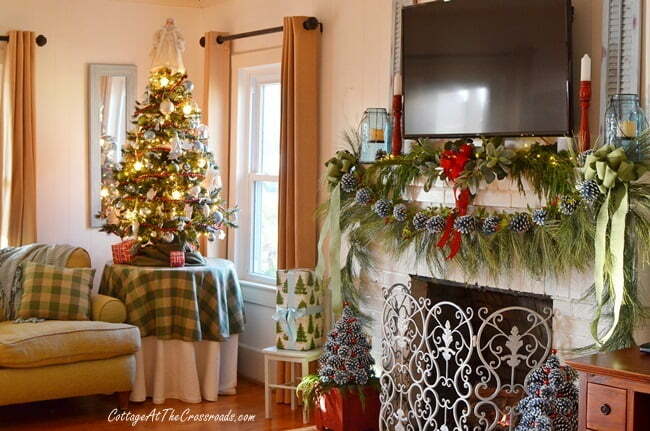 The your “semi-homemade” pinecone garland is the perfect compliment to the pinecone trees. 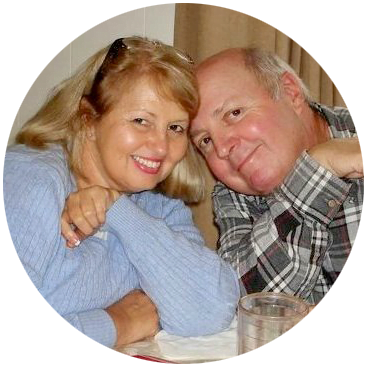 Just love seeing your home decorated for Christmas … and love seeing your little “elves” from year to year….Have a Very Merry Weekend Jane..and regards to your sweet Leo! !